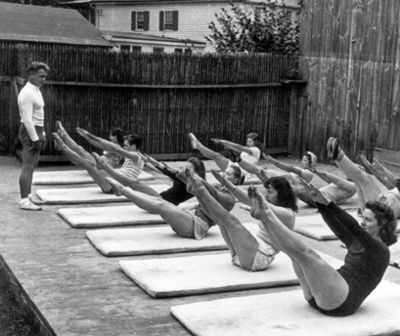 Why Joseph Pilates Created Pilates Apparatus? Hope you’re having a Pil-easant Week! It’s totally normal for 1st timers and beginners to feel intimidated by the different kinds of Pilates equipment as each apparatus looks super busy with springs, straps, handles…etc. The detailed nature of the equipment correlates to the detailed level of exercises that one can do to target and strengthen specific and different muscles in the entire body. Every Pilates apparatus is creatively designed by Joseph Pilates (Creator of the True Pilates Method) and the purpose of the equipment is to challenge as well as support students perform Pilates exercises that are adjustable according to individuals’ needs and capabilities. The apparatus is designed to make the body move through a range of motion exercises that encourage the ‘extra’ movement; the extra stretch, the extra resistance to build muscles as well as a strong core. After regularly practicing Pilates on the equipment, the body reconditions and transforms for greater flexibility, proper spine alignment, correction of muscle imbalances and maintenance of overall health. Pilates studios worldwide trust the Pilates method as there have been historical clinically proven results in the past years especially in the case of rehabilitation. Joseph was considered a health genius during his time; each Pilates equipment was developed with great thought; i.e., the width, the height, the level of spring resistance…etc. were all designed for a specific purpose. The objective was to have apparatus that would create movements for the body instead of the body doing all the work on its own. That way, exercises on the different machines are altered to fit the person’s existing body condition, especially during injury recovery. Nowadays, Pilates equipment is evolving yet trying to maintain the true essences of the original design that was developed by Joseph. Nevertheless, the best results are achieved when correct Pilates exercises are applied on apparatus that are closest to the authentic creations by Joseph Pilates. His aim was to encourage people to connect to his exercise method as it involves dwelling on the body’s capabilities to heal itself with the support from the mind regardless if you were trying to recover or just wanting to improve your existing physical condition. It was said that his apparatus was built by his brother, Fred Pilates who also re-engineered furniture to master Joseph’s creativity. So if all the Pilates equipment led to the same or similar benefits, why did Joseph Pilates create so many different Pilates equipment? Joseph first introduced Matwork, a series of range of movement exercises on the floor for German citizens who accompanied him during his internment. This helped to build strength and endurance for all the people he surrounded during this time and this set the foundation of his unique exercise method. Performing exercises on the floor was challenging because the body weight applies the resistance to the exercises. Joseph realized that only a few people were able to perform the exercises correctly on the Mat, hence the push to invent equipment to support the majority who didn’t. Joseph had introduced several equipment, however, we will focus on the ones that he was highly known for. Originally known as the Trapeze Table, Joseph invented this traditional apparatus by attaching some form of springs to hospital beds. He got bed-ridden patients to move and correct their muscular conditions while lying down on bed and using the bedsprings as resistance. This proved to be extremely beneficial for rehabilitation and physical therapeutic purposes and he found that by going against gravity, he could get the patients to align the spine and the pelvic area much more effectively with every exercise he made them do. Today, the Cadillac Apparatus is a raised bed with a metallic framework attached to straps, bars, springs attached to it for resistance and general assistance to all the exercises. 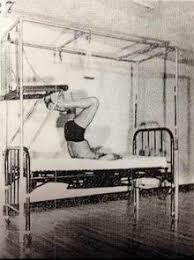 A lot of Pilates studios till today, use this to improve spinal flexibility and alignment. In order to further penetrate his method and to address improper ways of doing Matwork on the floor, he developed a wooden bed frame that could slide back and forth with weighted springs for resistance à hence the development of the Universal Reformer Apparatus. Today, the Universal Reformer Apparatus evolved by having a Mat attached for individuals to perform Matwork exercises correctly and efficiently as the reformer moves naturally along with the body; correcting and reconditioning the body through movement patterns and controlled resistance along the way. Exercises can be done while sitting, lying down, kneeling or standing up. Joseph later introduced the Pilates Chair, (also known as the Wunda Chair) for individuals to practice his exercises at home. This piece of apparatus could fit in apartments in New York since it was one of the smallest Pilates equipment that had a touch of a “Reformer effect” to it. The apparatus has a sloped seat with handles, adjustable springs and padded pedals for individuals to perform vertical forms of Pilates exercises. This apparatus also had a dual benefit, whereby, when flipped onto the back, it converts to a chair-like furniture that Joseph believed had the best position for the body when seated. Exercises on the Pilates Chair were targeted towards strengthening the core, for upper body, lower body, joint and bone stabilization. He was also known for his Barrel invention where he used empty beer barrels with further adjustments to create a ‘hump’ for individuals to stretch and extend their spine and promote greater flexibility as well as core strength. The main purpose was to correct any misalignments as well as maintain the natural curvature of the spine. This piece of equipment also addressed any issues related to the back and shoulder due to posture or age. Applying different resistance levels on an apparatus encourages greater adaptation to the neuromuscular system which means every rep of exercise is done correctly with conscious effort and awareness at all times because it’s all controlled by the resistance set on the apparatus. With regular practice using adjustable resistances on an apparatus ensures quality and correct movement patterns at all times. I, being a 2nd Generation Pilates Master, have had the privilege to be trained and coached by Pilates Elders and during my early training years, we worked with a variety of apparatus that were closest to the authentic creations of Joseph Pilates. I’m therefore comfortable and confident with all the apparatus we procure at Sana Motion because having extensive and specific knowledge about each apparatus gives us credibility as well as confidence about what kind of equipment we work with and what we offer to our clients. Moreover, the Swiss Pilates Institute (SPI) offers a variety of International Apparatus Certifications to educate passionate professionals to become teachers who understand the useful properties of each apparatus along with its dimensions and why it was engineered in a certain way. Most importantly, we work on educating students to understand how the apparatus creates a chemical reaction between the body and mind during each exercise.